In volume 10 of the GINZA×CSR series, we asked about the employee participation CSR program at Novarese, a company in the wedding coordination and restaurant business. Novarese supports mandarin orange farmers and farmers in various regions and has even assisted in product development. Kazuka Nohara of the Public Relations Division talks about enabling true hospitality by learning about food through interactions with farmers. ─ Your company is involved in forest preservation, children and food as its area of CSR. The first activity was planting trees to match the number of weddings. The problem was that we were merely donating the funds for tree planting, and there was no actual employee participation. While it certainly helped the environment, the company president was doubtful that this was enough as the sole initiative for the whole company. He then searched for another activity that employees could take part in and that would be something only Novarese was capable of. ─ Why was he insistent on employee participation? Novarese places a strong focus on human resource development. If being directly involved in CSR activities gives employees a sense of having contributed to society, this will lead to their growth as an individual. More well-rounded employees means that they will not stop at simply carrying out CSR activities as a company-based initiative, but may attempt to contribute to society in other areas of their lifves The idea was that guiding employees in this manner and improving the environment is more important. ─ You support farmers in the food domain? We provide about 20,000 meals a year for weddings. But, looking back at our own dietary habits, we noticed that we were not mindful of what we ate and had no clue how food products were produced. This meant that we could hardly provide true hospitality in our services. 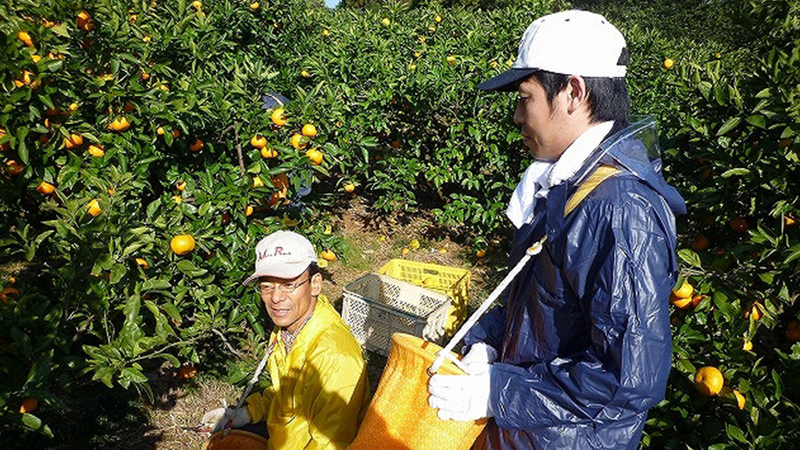 So, we asked some mandarin orange farmers in Shizuoka prefecture to let us help in the harvest. Farmers are under the spotlight for issues like a lack of successors, increased aging of farmers and desertion of arable land, so we thought about how we could help out in August and December that are slow months in the wedding business. We are currently providing assistance to fruit farmers in Aomori prefecture and rice farmers in Niigata prefecture. In 2011, we collaborated with Shizuoka mandarin orange farmers to develop and sell “Omosu” vinegar made with oranges picked from thinning that were previously underused. The initial supply of 950 bottles sold instantly and we increased production to 3000 bottles in 2012. ─ How did you move from helping the harvest to product development? When going to help the farmers, we would hold workshops where we would offer information from our company to consider how companies could help resolve local issues. At the first workshop, we learned of the problem that farmers only sold products to agricultural cooperatives, and never had a chance to directly see the joy of customers purchasing their crops. We thought that if the farmers could make their own products and sell them at a local production shop, they could directly interact with customers, and we began making plans to create products. ─ What type of assistance did you provide in this project? We helped in orange tree thinning and offered advice for product planning and advertising. For example, we envisioned the attributes and family composition of the target customers for showrooms, underground floors of department stores, local production shops and local supermarkets, and worked together with the farmers to devise a product, bottle design and product name that would appeal to those customers. ─ Were the farmers happy about it? At first they were hesitant to let in amateurs. Nevertheless, we took part in training workshops beforehand and worked hard to learn about the farmers’ environment, circumstances surrounding food products in Japan and the local history and culture. This led to communication with the farmers. In time, the harvest efficiency improved and the older men and women became rejuvenated. Fathers and sons who rarely conversed were given a common opportunity to do so through the presence of a third party, leading to further happiness as a side effect. More than just being accepted as some new staff, our presence led to revitalization of the organization and the local area. We are happy to say that we will continue to cooperate with them over the medium- to long-term. ─ How has Novarese been able to help in a way no one else can? In addition to manpower, we can also provide knowledge of a company involved in wedding and restaurant business. Farmers cannot implement sixth sector industrialization* of agriculture if they lack knowledge. It is important that our staff do not do everything ourselves, but instead take a stance of offering support with our company’s resources, by way of sharing advice, knowledge and our sales and distribution network for gifts given to guests at a wedding. And then, most important of all is motivation management for the farmers. *Sixth sector industrialization = Agriculture and fisheries and other such industries become involved in food processing, distribution and marketing to increase the diversification of the business. ─ What exactly is motivation management? For example, we set a goal of squeezing 20 kg of oranges in 30 minutes, and then lower the time limit to 25 minutes the next time, trying to increase efficiency. Before you realize it, this becomes more fun than the work itself, and a sense of ambition develops. What we learned was important through product development was not making products, but determining who the product was being made for and what pleasure would be derived for us through its creation. We had to maintain a strong team energy and interest to make sure this was always apparent to the farmers. I think that this type of support is something that only we at Novarese are capable of, with our knowledge in human resource development. ─ How did the project affect participating employees? They became more careful of their eating habits. Entering the fields and fruit groves for the first time allowed them to realize how the food they ate without a second thought was being made by the hands of individual people. Some who had previously often bought premade meals at the convenience store started buying ingredients at the supermarket and making their own meals. They started checking the labels on products and many switched from sweet breads to rice as their staple. After having meals with the farmers’ families, some even started contacting their own mothers and fathers. ─ So, their participation opened their eyes to big realizations. When they thought of it as work, they considered agriculture a kind of work that is completely different from the wedding business. They later realized that the conviction in a process of creating something as a professional and providing it was exactly the same in wedding business and agriculture. Some employees were able to look at their own occupation objectively and even reconsider their career plan. ─ Are those realizations put to good use in their jobs? To employees that lacked any interest in food despite providing meals at weddings, the agricultural production areas were simply semantics. When they actually do agricultural labor at the sites under the blue skies listening to the sounds of birds singing, they begin to feel emotional attachment and passion, and start using the right words with clients. We are grateful for the hospitality they provide in accepting us when we go to the farmhouse, for example by having things set up so we can work easily or by getting the rain off us. It makes us wonder just how much we are thinking of our clients when providing services. It has made us reconsider our thoughts on hospitality that is an essential part of a value-added business like wedding business. We have learned a lot more because it is a different type of industry. ─ Novarese does not translate CSR as “corporate social responsibility,” but instead take the acronym to stand for “Chotto Sutekina Revolution” (=a small but wonderful revolution). Companies are built up by individual employees. For CSR initiatives as well, we do not want them to be undertaken by the “container” of a company, but rather by the people in that company carrying out their own personal revolution. This is the idea behind it. ─ Novarese moved to Ginza in 2009. While window displays on the busiest streets show world-leading creations, the back streets are lined with many charming veteran shops. Quite a lot of people gather here that truly love the history and culture of Ginza. Mothers and daughters come shopping together in this area that can be enjoyed by families of all generations. As a company that values family bonds, we feel that Ginza would be the best area even if we were to search the world over. Division Manager of the Public Relations Division, Sales &　Marketing Department, Novarese. Inc.
After working as a curator for an art museum, joined Novarese in 2001. Worked as a wedding coordinator and planner. Moved to the branding office in 2004, then to her current division where she works on all aspects of public relations for Novarese. Also involved in the company’s CSR programs.